I wrote my first play, The Family, in 1979 and 80, while still living in Regina, preparing to go to York University in Toronto to do my MFA in Theatre. My fellow classmate at York, the late and beautiful Larry Lewis, read the play and loved it (he said he read it in the bath, which I have always taken to be a good sign) and we produced it at the back space at Theatre Passe Muraille in December, 1984. We used this production as a good excuse to start a little theatre company which we called ACT IV, as there were four of us: Larry Lewis, Sally Singal (pictured below), Anthony Dunn and myself. We remounted the play the following year at Adelaide Court Theatre. This is the only play I wrote on a typewriter. All the others were word processed. For this reason it looks so archaic it’s almost like it came from another era, which I guess it did. I remember well that compared to writing on a computer, typing on a typewriter is a lot of hard work. I will post a scan of the title page when I figure out my new scanner. I have the original and could make a copy available for anyone who is interested. 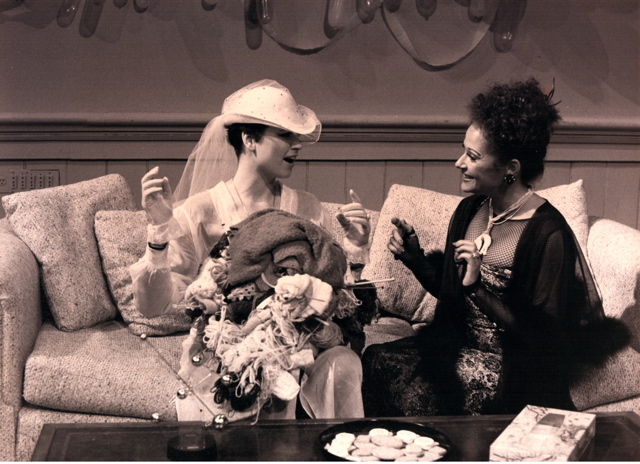 Sally Singal and Roxanne Hill in my very strange first play, "The Family." Produced by ACT IV at the old Adelaide Court Theatre in Toronoto, 1985.